ARAÇUAÍ, Brazil, Jul 7 2009 (IPS) - Maria Vieira dos Santos has raised her six children practically on her own. For more than a decade, her husband would be away from home nearly eight months out of the year, travelling 1,500 kilometres down south to cut sugarcane in the state of São Paulo. His prolonged absences to work in faraway fields only ended when the terrible conditions he worked under left him with a spinal injury. Eight years ago, the couple’s eldest son, now 27, took over for his father and began working in sugar and alcohol production, and this year their 17-year-old son has followed suit. Cane cutting is extremely arduous work, with the labourers living and working in inhumane conditions that violate their labour rights. But it has an additional, cruel effect on the families of the cane cutters. In exchange for pay of roughly 500 dollars a month, the men endure temporary migration and perform harsh tasks that demand strong, able arms to expertly wield a machete. The plight is no less wretched for the wives left behind, the women who call themselves ‘viúvas de maridos vivos’ (widows of living husbands). Premature aging is the most visible sign of the many exhausting tasks that the women take on. Almost all 38 families of Banco de Setúbal, a rural village in the municipality of Araçuaí, Minas Gerais, supply the powerful sugarcane industry with field hands. Their men join the legions of labourers who seasonally migrate south from the northern part of the eastern state of Minas Gerais to find work in São Paulo’s cane fields, escaping the region’s devastating dry seasons. Locally “we can only grow a small crop, and that’s just when we have rain. Three years ago we lost everything, and last year we weren’t able to plant much,” which is why the men are forced to leave their families behind and seek work elsewhere, Maria dos Santos told IPS. Araçuaí is located in the Jequitinhonha Valley, within the lower fringe of the “sertão,” a vast semi-arid region in northeast Brazil that is afflicted by persistent drought. “I had to tend to everything: planting corn, beans and rice, labouring on the farm all day long,” said dos Santos, one of the many women who raise their children alone while taking over their husband’s workload on the family plot, planting and harvesting to take what little yield they obtain to the market. Dos Santos, like so many other women, was for a long time the “solution to everything at home,” taking on numerous chores traditionally performed by men. She often had to tackle her huge workload while pregnant. Pregnancy is another burden that the women of Banco de Setúbal and other labour-supplying communities must bear, as most babies are born near the end of the year. 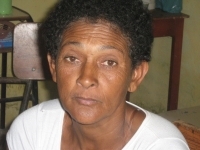 Besides the strain on the body, “the heart is weighed down by sadness, tears, and nostalgia,” said this 50-year-old woman who has always lived in Araçuaí and has two married children and two grandchildren. Her father also migrated south to the backlands of São Paulo to find work in the banana harvest, she recalled. Banco de Setúbal is 18 kilometres away from the town of Araçuaí, where the urban population also leaves home to cut sugarcane. The town of Araçuaí, population 36,000, is known as the ‘land of the widows with living husbands.’ Every year, thousands of men are driven away from their families to work on the sugarcane plantations, in an exodus that begins early in the year. “They come back in bad shape, they get sick from all the dust, smoke and ashes,” dos Santos said, referring to the effects of the controlled fires that are set in cane fields to clear excess leaves and prepare the cane for cutting, with severe consequences for the local environment and the workers’ health. In December, long lines of buses jam the road into Araçuaí, announcing the return of the men, while many others travel home on motorcycles newly purchased with the wages they earned, which also help boost the local economy. Here “motorcycles are every boy’s dream, and the more powerful the better, because that helps them win the girls over,” said Viviane Neiva, head of the Caminho das Águas Project, implemented by the non-governmental Popular Culture and Development Centre (CPCD) to protect rural environments, in particular rivers. Many women have learned to drive motorcycles due to the absence of other means of transportation, especially in the countryside, she added. Despite the lack of employment opportunities in Araçuaí, not many people migrate for good. “This place is just too good, second only to heaven,” remarked Ornelino de Souza, one of the few men at a community meeting in which IPS participated and whose enthusiasm drew more than a few laughs. As a young girl, Antonia Neusa dos Santos, now 52 and a mother of three, migrated to the city of São Paulo, where she scraped a living as a domestic worker, and by chance married someone from back home. Twelve years later they came back to their hometown “for good.” “I didn’t feel like I belonged in São Paulo. Everything’s really nice there, easy, but I don’t like it,” she told IPS. Besides, “I’m very close to nature, I feel better here,” she said. But her husband and son were not able to escape their fate as seasonal migrant workers. “We don’t have much land, only four hectares,” Antonia dos Santos explained. But she’s relieved that sugarcane cutting is much safer now, and that workers have protective gear that enable her men to “come back in good health.” Her husband, who she says, “smokes so much it’s a miracle he’s so strong,” has only suffered minor mishaps. In her opinion, the “only way” to keep people in Banco de Setúbal would be to open a garment factory, because that would create many jobs, in particular for women. “Several women are needed to make a shirt, each to sew up a different part,” she pointed out. So he decided to plant bananas on his own plot, which is “blessed” with a nearby stream that irrigates his land. His first crop was almost destroyed by pests, but the bank cancelled his debt, and he was able to survive with the meagre yield he obtained. His sons have taken the path of sugarcane field work and the eldest has worked as a cane cutter. But this year he decided he wouldn’t go back, because “when the sun burns, his nose starts to bleed, and health comes first,” de Souza said. The 21 families in the nearby village of Alfredo Graça have formed a cooperative to produce corn, beans, cassava, and garden produce, which they sell at the Araçuaí market. As a result, most local men have stopped migrating. They only cut the cane they grow for ‘rapadura,’ a sweet made from the unprocessed cane juice. José Claudio Francisco, however, still migrates. Nothing grows on Banco de Setúbal soil without irrigation and water is scarce, he remarked as he was getting ready to board the bus for Campos, north of Rio de Janeiro, to cut cane for the next six or seven months. With five small children, all under eight, what Francisco fears most is mechanisation. In São Paulo, Brazil’s largest sugarcane producing state, the sugar and alcohol industry has pledged to have harvest operations fully mechanised by 2017, in order to eliminate cane field fires. And environmental groups are pushing to move up that deadline. If the goal is met, “we’ll be out of a job,” without any prospects of future employment, Francisco said. The sugarcane industry accounts for 7.5 percent of Brazil’s GDP – some 68 billion dollars – and 27 percent of agricultural GDP. It also creates direct employment for 800,000 people, chiefly cane cutters recruited from the country’s most impoverished areas. Children are affected by the absence of their father. They lose their connection with them, “they don’t recognise them when they come back home, they push them away and cry” whenever fathers try to show some affection, said Edilucia Borges, head of preschool care at CPCD, which works on education, environment and development issues in Araçuaí and other Minas Gerais towns. To mitigate the effects of separation and strengthen family ties, CPDC launched a letter-writing project that encourages seasonal sugarcane workers to communicate with their families through notes, photographs and sound recordings. That way, fathers “won’t be so much of a stranger to their children when they come home,” Borges said. As of three years ago the family is no longer separated, because they’ve found other sources of income. Thanks to a mill for cassava meal production, the construction of tanks to collect rainwater and the planting of organic produce as well as rice and bean crops, the family now makes enough money to secure a livelihood. Plus, three of their five children are now living on their own.